Drone flying is a rising hobby with more and more enthusiasts flocking in every day. Some do it for fun and some are into drones for practical purposes. A drone is a very intriguing tool and a most effective one when it comes to getting pictures from interesting angles and get you those sweet shots you wouldn’t be otherwise able to make. Here is our ultimate guide for the best drone under $200. Everyone needs to start small. A novice pilot is, well, a novice, and it takes quite some practice for someone to master flying a drone. Needless to say, you’ll be crashing a lot, and, because of that, it wouldn’t be a good idea if you bought a $1000 drone. For a beginner, the best price would be no more than $200. These drones are well made, sturdy and very easy to fly. Their low price also makes them appealing, as they are easily replaced and their parts are inexpensive. So, if you’re a beginner drone pilot, we’ve got 10 excellent drones all priced under $200 for you to choose from. Our first drone is the ZuZo Quadcopter Drone. This is one of the best beginner’s drone because it is very maneuverable and very easy to fly. It is nimble and has plenty of features to keep you entertained. The drone has the 6-axis gyroscopic stabilization system, making it very stable and easy to control. It also features the Headless mode which allows you to fly the copter in any direction you wish without having to worry about which side is the “front” of the drone. The “front” in Headless mode is the direction you yourself are facing (rather, the controller). The drone also has a nice 2 MP camera and comes with a 4 GB MicroSD card that gives you plenty of room to store your photos and videos. The copter is operated by a 2.4 GHz frequency controller, which extends the range at which you’ll be able to control the drone, and allows for multiple drones to be flown at the same time without interference. It has a rechargeable battery that offers 8-10 minutes of flight time and takes an hour to charge from zero to full. Excellent beginner’s drone, very maneuverable and easy to fly. Headless mode makes flying even easier because you don’t have to worry about direction. The 2.4 GHz controller gives a little bit more range to the copter and allows for multiple machines to be flown without interference. The drone battery allows for an 8-10 minute flight. Takes an hour to recharge. All in all, this beauty is made for novices. With its excellent maneuverability and mobility you’ll be flying like an expert in no time. Syma is a powerhouse manufacturer in the drone business. It consistently produces high-end machines like the X8G. The X8G is a very beginner friendly drone that really makes for an excellent learning platform. This is due to the gizmo’s 6-axis stabilization system that makes the copter very maneuverable and very easy to control. It also has the famed Headless mode that really helps the new flyers, as they don’t have to worry about the direction they’re flying. Forward is always where the controller is pointing, so you don’t have to worry about confusing which way are you going. The copter features a very good 8 MP camera. This camera supports 720p and even 1080p video quality. Also, the case for the camera is compatible with an action GoPro camera, so if you have one, you know you can mount it onto this machine and get some awesome footage. The controller is also the 2.4 GHz one, so the drone has a nice range and the connection will not be interrupted even if several drones are flown at the same time. A very stable and easy to fly drone. Has the famed Headless mode that makes the drone a very good learning platform. The drone has an excellent 8MP camera that supports 720p and 1080p quality. The drone is controlled via a 2.4 GHz controller. 7-10 minutes flight time, 2 hours recharge. When all is said and done, this is an excellent drone with an excellent pedigree. Its stability and maneuverability are stunning and you’ll master its controls in no time, while the 8 MP camera will provide you with superb quality footage, making this drone a slam dunk for a beginner. UDI 818A is a wonderful craft for all who seek to get to know the hobby of drone-flying a little bit better. 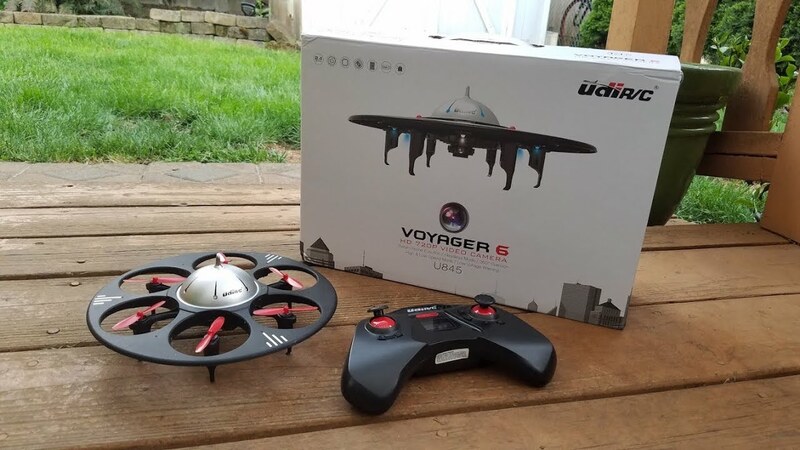 With excellent performances and durability, the UDI 818A is a superb entry level drone and a valuable learning platform. The copter is outfitted with the Headless mode feature, which allows novice flyers to concentrate on flying because it eliminates the necessity to constantly check for the nose of the aircraft. On top of that, the drone is outfitted with the 6-axis stabilization system, making this craft almost crash-proof. The craft also has the innovative Return home button that allows you to recall the aircraft with a simple press of a button. This is greatly beneficial to those who have trouble landing the drone, of if you’re unsure as to where you exactly are. On top of that, the craft has a 2 MP camera that offers a decent quality of videos and photos. The controller for this drone is a 2.4 GHz controller featured in all major drones, and it allows you to fly it a little but further out, and to fly multiple drones at once without the signals snapping and interfering with each other. Easy to fly thanks to the Headless mode. Return home button allows you to recall the craft automatically. 4 GHz controller allows for extended range and multiple drones to be flown at the same time. All in all, this is a wonderful drone that offers a great learning curve. It is easy to fly and easy to master, and it will most certainly be a great starting drone for you. The F181 is another copter with a pedigree, and as such, it is one of the greatest copters available on the market. The copter comes from Holy Stone, another powerhouse in the drone world. So, the copter is of the finest quality and has enough features to make it appealing to both novices and even expert fliers. The drone has the headless mode which makes it greatly beneficial for those just learning how to fly. It also features the Return home function that is great if you think you’ve lost the copter. But, this device has even more surprises. This copter features the Altitude hold function. This feature allows you to release the throttle and the copter will stay in the air, eliminating the need for manual balancing. This is also largely beneficial to photographers, as they can take a great shot, because they are able to bring the craft to a halt, and really take the time to set up for the photo. The controller is the 2.4 GHz one, which gives the copter the range of 100 meters. It can fly for about 9 minutes. Comes from a recognized brand. Altitude hold mode allows the copter to hover so you can take a nice shot. Up to 9 minutes flight time. All in all, if you’re looking to get into the world of quadcopters, you can’t go wrong with buying the F181. Its low price, superb handling and marvelous durability will be everything you need for in a beginner’s copter. Another Syma product, the X5C is a superb copter with excellent performances. The quadcopter has been outfitted in such a way so as to provide maximum assistance to a beginner pilot. It has the Headless mode that allows the copter to fly in any direction regardless of where its nose is. The device also has the 6-axis stabilization system that makes the copter very stable in the air and allows it to do a 360-degree flip, thus creating some incredible footage. In addition, this drone possesses two speed modes – low and high-speed mode. The low-speed mode allows you to fly the copter in tight quarters, and exert more control. The high-speed mode allows the copter to go at its full speed. The X5C features a 2MP camera and a 4 GB memory card. It has an approximate flight time of seven minutes and takes 100 minutes to be charged. It also features two control modes that allow you to set the controller to either right or left handed controls. Headless mode provides a novice with an excellent learning curve. The 6-axis stabilization system allows the copter to be very steady in flight and allows it to do 360-degree flips. Two speed modes allow the copter to fly in tight quarters easily, and to fly outdoors at full speed. The copter takes 100 minutes to charge and has a 7 minute flight time. All in all, this is a superb entry level copter. It is made by a powerhouse manufacturer, which goes to lengths to prove its excellence. If you’re looking to start somewhere, start with Syma X5C. And we have another Holy Stone product, the X400C. This is not exactly an entry level copter, but it still has plenty of features to soften up the learning curve. It features the headless mode that helps the novice flyers get comfortable with the machine because they don’t have to worry where the nose of the copter is in flight. However, the copter is pretty fast, and the throttle should be handled with care in order to avoid crashes. The copter is also fitted with the 6-axis stabilization system that really balances the copter out, and gives it that smooth nimbleness praised by beginners and experts alike. On other note, the copter has an 8 and a half minute flight time with a full battery. It takes 80 minutes to charge it form empty to full and has a 100-meter flight range. It is also advised that you take 10 minutes between flights for the internal components to cool down in order to avoid damage and promote a longer life span of the components. The copter features the Headless mode to promote better learning curve for novice fliers. 6-axis stabilization system makes the copter nimble and stable. 5 minutes of flight time, takes over an hour to charge the battery. Take 10 minutes between flights for the drone to cool down. In a nutshell, this is an awesome copter with superb performances. The copter is fast and nimble, but still very manageable for a newbie, making it an excellent choice for beginners. Meet UDI U818’s older brother, the UDI U842. This copter is more or less the same as the U818, but with improved performances. Just like the U818, the U842 features the Headless mode that allows you to simply fly the copter in any direction you desire without worrying where is the nose on this thing. It also has a 6-axis stabilization system that makes it very stable in the air, allowing for advanced maneuvers even by novice pilots. It also features an excellent camera that supports 720p quality footage and films at 30 fps. The controller can be set to suit both right handed and left handed persons. The copter has a flight time of approximately 9 minutes and takes an hour to charge from empty to full. The controller has a 100-meter working range. Next gen copter, an improved version of UDI U818. Headless mode makes the copter very easy to master. A fine camera supports 720p quality footage, films at30 fps. Has a flight time of 9 minutes. Takes an hour to charge from empty to full. The controller can be set to suit left and right handed users. All in all, the copter is a blast. Nimble, reliable and fast, it is hard to find a better beginner’s machine than the U842. Up next, it’s the Holy Stone HS170 Predator. Being from Holy Stone, you know that HS170 is a genuine high-quality machine. It is very easy to fly, and very maneuverable. This is all thanks to its 6-axis gyroscopic stabilization system, as it makes the drone very nimble and steady. It also features the famed Headless mode that makes flying all too easy, because you don’t have to worry if you will be heading in the wrong direction and crashing. The drone has 3 speeds that allow it to be flow with reduced speed indoors, or at full speed outdoors. The drone is also very wind-resistant and can remain stable even in 10 mph gusts. It has a range of 30-50 meters. The flight time for this drone is 6-9 minutes and it takes 60-80 minutes to charge the battery. The drone has Headless mode making it very easy to fly. Has a range of 30-50 meters. In all, this is a Holy Stone machine, and that is proof enough of its quality. This drone’s maneuverability and control make it an awesome device for a novice pilot, so be sure to check it out. Another part of the UDI family, the U845 is an innovative drone featuring not 4, but six motors and propellers. This makes the drone extremely stable, in turn making it one of the best drones for beginner and even expert fliers. The drone has the headless mode, and because it’s round, you don’t have to worry about which is the right direction. Just put the drone on the ground and fly it in any direction, as it directly relates to the position of the controller. The drone is compatible with your smartphone, and you can control the craft via it. It also has the 6-axis gyro stabilization system which makes the drone even steadier in flight. The drone has a 6-9 minute flight time and a 30-meter flight range. The battery takes 120 min to charge from empty to full. A very stable drone thanks to its 6 propellers. Features the 6-axis gyro stabilization system, making the drone even steadier and safer. 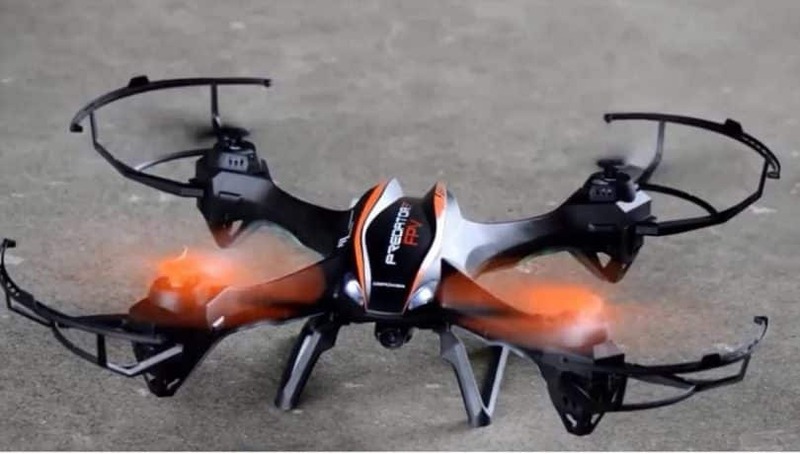 Has the headless mode for easy and convenient flying. The drone has 6-9 minute flight time and takes 120 minutes to charge. All in all, this is a wonderful drone, very nimble, maneuverable and stable. In all, it is a perfect drone for a beginner flier but provides just as much fun for experts as well. And our last entry is the QCopter QC1. A mini drone, this is the most beginner-friendly drone, and one of the most inexpensive drones on the market. Even so, the copter has been outfitted with the 6-axis stabilization system. It also has the headless mode that allows for an easy and worries-free fight. The small size of the copter allows you to comfortably fly it indoors. However, its small size is a double-edged sword, as it makes it vulnerable to fast winds, and it shortens its effective flight range. It does, however, reduce battery drainage, so the drone can fly for longer. The drone can fly for a maximum of 15 minutes, but with an additional battery, you can double the flight time. The copter features a fairly good 2 MP camera that supports 720p footage. Superb mini drone, easy to fly and inexpensive. The drone is very stable and maneuverable thanks to the 6-axis system. The small size disallows it to be flown in face of strong winds. 15 minutes of flight time, double with an extra battery. All in all, for a beginner, this drone is just about perfect. It’s inexpensive and easy to fly, so if you’re looking to start out, be sure to check this drone out. Well, that’s it for our best drone under $200 choice list. All of the drones are very favorable for beginner fliers. We purposefully made such a selection, because, as we said in the intro, the best bet for a newbie is to buy an inexpensive drone because they offer a better learning curve. That is also why the drones feature the 6-axis system and headless mode because these make the flying very, very easy, which helps you build up your confidence and skill. In any case, that’s it for us – be sure to check out our list and choose product most suited to your needs. But most importantly, whatever drone you choose, make sure you have fun with it.